It looks as if you mixed SIP versions: the version installed on your android device is most likely different from the one you used for the build? yep figured that out today on the plane. I’ve 4.11.2 on the device and 4.13.3 on ubuntu. Downgrade (or just a custom install) on ubuntu seem easier than patching android. 4.11.2 should be ok no? just say thanks for your work. i have the same problem in android 4.2 but I have no idea resolving those bugs. Any updates????? Eagerly waiting for the results of your great effort…. UPDATE please 🙂 Write few words about Your progress, when we could use python on Android. is it something new about this problem? just received your test post and had a look at your Android QGIS blog again to check if I missed something. Since this seems not to be the case I am wondering if you need any help on this. Not sure how 🙂 Beta testing, programming…? 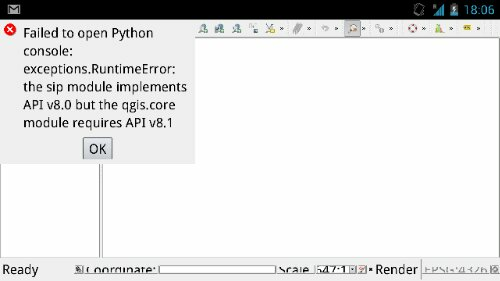 Is there anay good news about python support on android Qgis ? after 1 1/2 years: is the idea of Python support dead? I could imagine a brought interest. Hence, I am wondering if there are any fundamental technical issues. But there is Python and Kivi. I searched the web but could not find anything concerning Android+QGIS+Python that is not related to you. So I post here again (sorry for bothering). is Python it still on there roadmap?